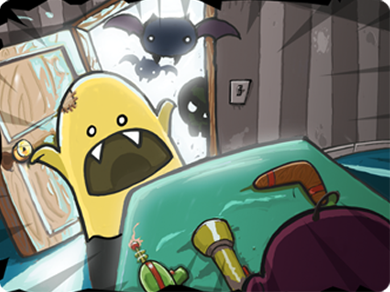 There are Creeps living in your closet! Defeat the things that go bump in the night with toy blasters, glue bottles, flashlights, and boomerangs. Summon a giant spider to slow your enemies, or a UFO to sap their energy! Battle Ghosts, Zombies, Aliens, Dinosaurs and more! Featured by Apple in "What's Hot"
Featured by Apple in "What We're Playing"
"The Creeps! is one of those few perfect titles." "The Creeps! is a grade-A game"
Now in high definition! There are Creeps living in your closet! Defeat the things that go bump in the night with toy blasters, glue bottles, flashlights, and boomerangs. Summon a giant spider to slow your enemies, or a UFO to sap their energy! The Creeps! are back and trying to ruin your holidays! Watch out for the latest EXPLOSIVE threat... fireworks! !